Mom and her girls. 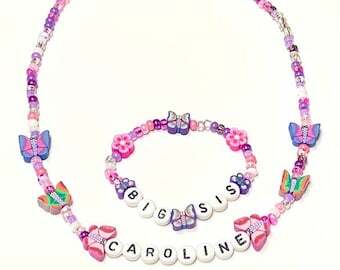 Personalized and customized bracelets for Mother, Big Sister, Middle Sister, & Little Sister. This listing is for ONE BRACELET. Purchase just the ones you need. The perfect gift for arrival of the new baby. 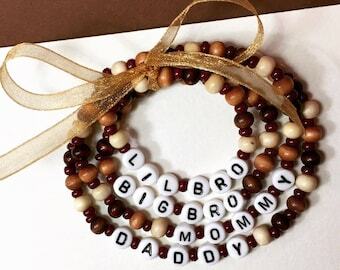 Makes a great baby shower gift, hospital gift or new big sister gift. Great for Mother's Day too! You can get them in any of the pearl colors listed in the 7th pic. ORDER INFO - For faster processing of your order please include the following info in the "notes to seller" at checkout for EACH bracelet. You can also choose to get this bracelet with your choice of the following charms. Sister, Big Sister, Middle Sister, Little Sister, Best Friend, Princess, Goddaughter, Daughter, Mother, Granddaughter, Grandma, Flower Girl, Bridesmaid. Need more than one bracelet? When you add the item to you cart just change the quantity desired. As long as you add everything and checkout only once the combined shipping rate will automatically calculate. Bead color or dye lot may vary slightly from the ones shown. If you would like it made to complement your teams colors or your child's favorite colors please indicate so when contacting me with personalization info. I ordered 2 of these newborn baby girl bracelets for our soon to arrive Granddaughter Lyla. I'd ordered from Stargazinglily.com almost 2 years ago for our Granddaughter Ava.I was so impressed with the first 2 bracelets that I knew exactly where to buy 2 more bracelets for our 2nd Granddaughter. The bracelets are beautiful and look so expensive. They aren't though. I highly recommend Stargazinglily.com.